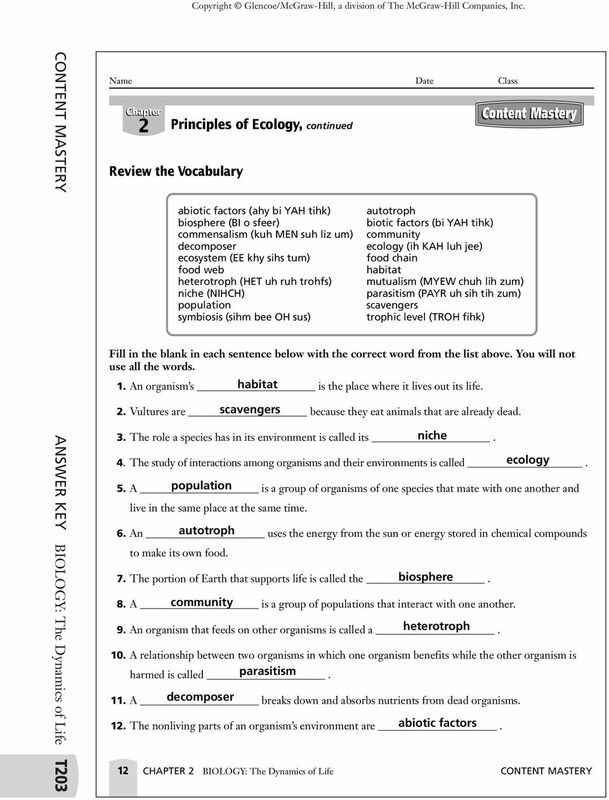 4 T0 ANSWER KEY BIOLOGY: The Dynamics of Life CONTENT MASTERY Get the Big Picture ABIOTIC Principles of Ecology Sunlight Water Air Land Oceans Deserts Forests ECOSYSTEMS Ecology is the study of interactions between the biotic factors and abiotic factors on Earth. Biotic factors are all living things. Abiotic factors are all nonliving things. An ecosystem is all the interactions between the biotic factors and abiotic factors in a certain place. Use the diagram to answer the following questions. 1. What things make up the biotic factors on Earth? Give examples. Biotic factors are all living things, such as plants, animals, and decomposers.. What things make up the abiotic factors on Earth? Give examples. Abiotic factors are all nonliving things, such as air, water, sunlight, and land. 3. What is an ecosystem? Give examples. An ecosystem is the interactions between the biotic factors and abiotic factors in a certain place. Deserts, oceans, and forests are examples of ecosystems. 4. During the carbon cycle, plants take in carbon dioxide gas from the air and use it to make food. So the carbon cycle involves the air and plants. Where on the diagram does the carbon cycle belong? 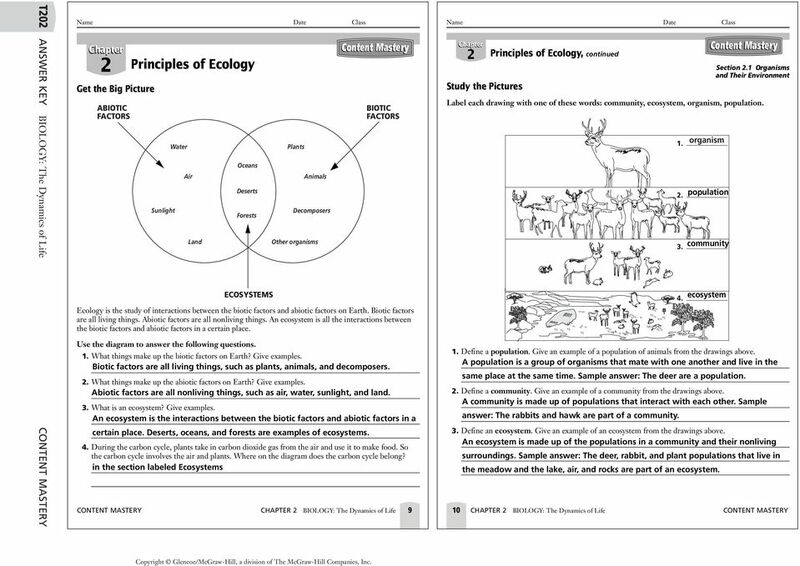 in the section labeled Ecosystems CONTENT MASTERY CHAPTER BIOLOGY: The Dynamics of Life 9 Plants Animals Decomposers Other organisms BIOTIC Study the Pictures Label each drawing with one of these words: community, ecosystem, organism, population. organism. population 3. community 4. ecosystem 1. Define a population. Give an example of a population of animals from the drawings above. A population is a group of organisms that mate with one another and live in the same place at the same time. 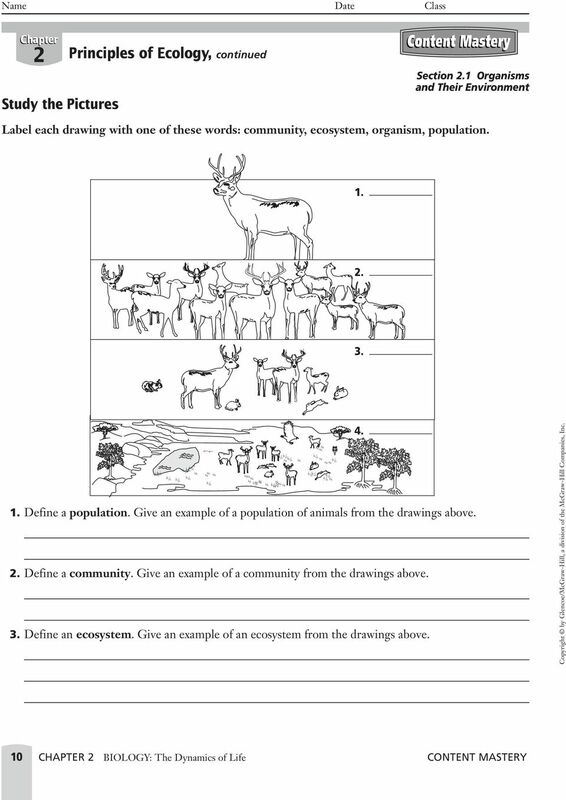 Sample answer: The deer are a population.. Define a community. Give an example of a community from the drawings above. A community is made up of populations that interact with each other. Sample answer: The rabbits and hawk are part of a community. 3. Define an ecosystem. Give an example of an ecosystem from the drawings above. An ecosystem is made up of the populations in a community and their nonliving surroundings. Sample answer: The deer, rabbit, and plant populations that live in the meadow and the lake, air, and rocks are part of an ecosystem. 1. 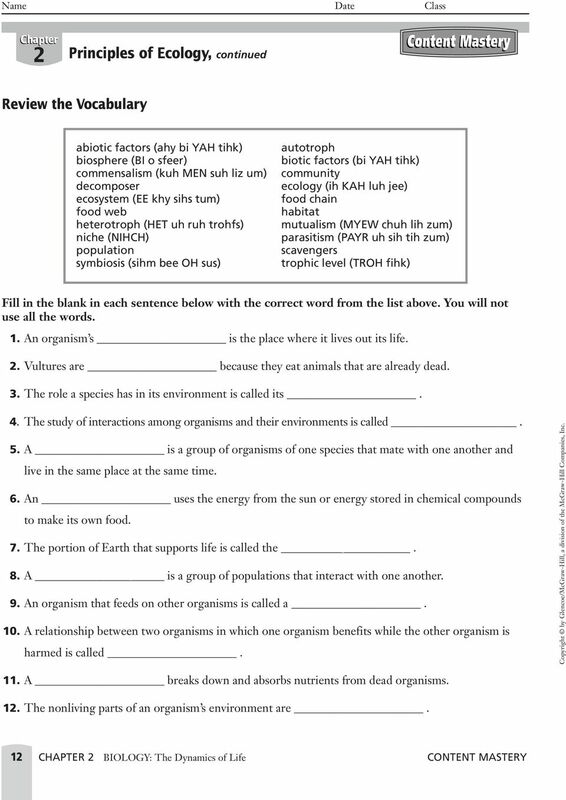 Section.1 Organisms and Their Environment 10 CHAPTER BIOLOGY: The Dynamics of Life CONTENT MASTERY Copyright Glencoe/McGraw-Hill, a division of The McGraw-Hill Companies, Inc.
Eastern Regional High School. F 2. Like nutrients and water, energy also recycles through an ecosystem. Contrast the flow of energy and chemicals in ecosystems. Explain how trophic levels relate to food chains and food webs. S T U D E N T J O U R N A L Name: Date: How does energy flow in a food chain and a food web? Part I: The Chain vs. The Web Draw one example food chain using your food web. Use arrows to show energy flow. 1. In food chains and webs, what trophic level must you have more of than others? 2. Each trophic level has how much LESS energy? 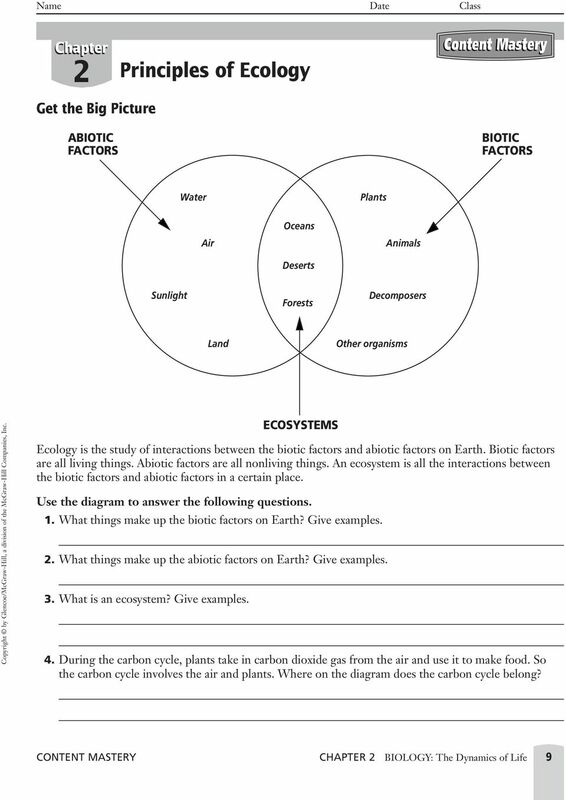 Ecology Food Web Multiple Choice Identify the choice that best completes the statement or answers the question. 1. A bird eats a worm. Who is the predator? a. the worm c. both the bird and the worm b. Food Chains and Webs --- "What's for dinner?" Food Chains and Webs --- "What's for dinner?" Every organism needs to obtain energy in order to live. For example, plants get energy from the sun, some animals eat plants, and some animals eat other animals. Section: What Is an Ecosystem? AP Biology Unit I: Ecological Interactions Essential knowledge 1.C.1: Speciation and extinction have occurred throughout the Earth s history. Species extinction rates are rapid at times of ecological stress. Energy Production In their daily struggle for survival marine animals perform a variety of activities e.g. movement - squids and octopuses use jet propulsion, scallops clap their shells and fish swim.